Momma on a Mission: Me? Supermom? Only if you are too! Someone called me a supemom yesterday. My first instinct was to laught out loud- I do NOT consider myself a supermom by any stretch of the imagination. Then I stopped myself, realizing that she was probably serious, and started to ponder. 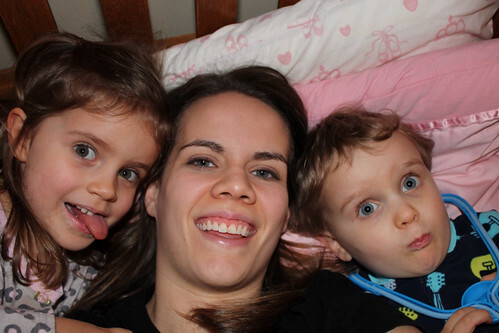 Having a blog does not make me a supermom. Posting cute pictures of my kids does not make me a super mom. Feeding them organic food, breastfeeding my two year old, using gentle discipline, co-sleeping and homebirthing- these things do not make me a supermom. Supermom- what does that even mean? I'm just a normal mom, doing the best that I can. The best that I can do is going to look different than the best that another mom can do. Not better, not worse, just different. Want to know the truth? I struggle with motherhood. Sure, there are parts of it that come really naturally to me(like the whole mothering a newborn thing- it totally clicked for me from day one), but there are so many other parts that don't. Most days I'm tired, frustrated, and giving this thing my best shot, hoping that I don't screw my kids up too badly. Really. See? Cute picture of us having fun, and Hayden has toothpaste on her face still. Honestly, my personality type (INTJ) is not the greatest suited for motherhood, especially stay at home motherhood. I'm a BIG introvert, so being around small people that need nearly constant interaction all day every day is difficult for me. I do lots of internal thinking and processing, and having toddlers around is a direct conflict with that most of the time. Nothing like being in the middle of deep contemplation and being interrupted with, "Mommy! I pooped!!!" It's a daily struggle to balance my need for learning, thinking, and processing with their needs for interaction and play. I read the other day that INTJs and ENTJs are the types that are most likely, as mothers, to work outside the home, and it was incredibly validating to me just to hear that. I often think that I would be a better mother if I was working outside of the home at least part time. That's not a realistic possibility for us right now, but even just acknowledging to myself that my current situation is not idea for my personality is helpful for me, and helps me to not feel so guitly or helpless when I do get frustrated. As an introvert, especially an introvert that was fairly sheltered as a kid, I'm not very social. I don't make enough playdates or provide enough social interaction, especially for my extroverted kid. I struggle with giving them enough outside time. I don't always enjoy playtime, and we don't do a lot of fancy crafts. These are things that I'm working on, but I'm also giving myself space to be imperfect and not beating myself up over these things. Parenting is a hard job, and more and more lately I'm choosing to give myself credit for the things that I have done right, instead of beating myself up for what I haven't done. And surprisingly, when I do let go of that guilt, I feel so much more confident that I actually feel freer to accomplish some of those things that I was feeling guilty about not doing before. Guilt doesn't help me become a better mother, it holds me back from becoming a better mother. I'm not perfect. I get frustrated, I sometimes speak more harshly than I should, and sometimes I just need a BREAK already! But I never stop trying. I never stop telling my kids that I love them. I never stop trying to do my best to show them that I love them. To me, that's what a supermom really is- someone that loves her kids and is trying to do her best. And that's going to look a little different for every mom. Let's stop comparing ourselves, stop beating ourselves up, and instead acknowledge and celebrate all the good that we do accomplish. Me? Supermom? Only if you are too! I think we're all pretty darn super. Let's start giving ourselves credit for it.